Dibawah ini adalah latihan soal try out online ujian nasional unbk bahasa inggris sma tahun pelajaran 2019/2020 disertai kunci jawaban dan pembahasan. Semoga bisa menjadi prediksi soal ujian nasional un unbk sma tahun 2019 mata pelajaran bahasa inggris. Soal & Pembahasan Try Out Online UN (UNBK) Bahasa Inggris SMA Tahun 2019. Taman Mini Indonesia Indah (TMII) or "Beautiful Indonesia Miniature Park " (literally translated) is a culture-based recreational area located in East Jakarta, Indonesia. It has an area of about 250 acres. The park is a synopsis of Indonesian culture, with virtually all aspects of daily life in Indonesia's provinces encapsulated in separate pavilions with the collections of architecture, clothing, dances and traditions are all depicted impeccably. Apart from that, there is a lake with a miniature of the archipelago in the middle of it, cable cars, museums, a theater called the Theatre of My Homeland (Theater Tanah Airku) and other recreational facilities which make TMII one of the most popular tourist destinations in the city. Man : What you like most, soccer, badminton, or basket ball?. I don't like none of it. That would be great to play with you! Almost everyone eats bread daily, especially for breakfast. bread making is not a complicated task. You only need flour, water, yeast, sugar, salt, oil, butter, and an oven. Choosing good flour is the step in making bread. There are two kinds of flour, soft and hard. Hard flour, made of winter wheat, is a better choice for making bread because it produces bread that has a better texture and taste. Then, lukewarm water, yeast, sugar and salt are mixed with the flour to make dough. Yeast is a microscopic organism that is capable of producing carbon dioxide. It can make the dough rise or expand. Both sugar and salt give flavor to the bread so that it tastes nice. They, however, have different effects on yeast. After that, oil (such as olive oil, corn oil, peanut oil) and butterbare added because they are essential to make the bread tender. After mixing the ingredients, the dough is sent to the oven. Why is hard flour a better choice for making bread? It can make the dough rise or expand. It is capable of producing carbon dioxide. It can make the bread tender. It can produce bread with better texture and taste. It gives flavor to the bread. Study the following sentences related to making an omelet. 1. Beat the eggs and milk together and when mixed thoroughly, add to the frying pan. 2. When cooked remove from the pan and serve with a garnish of parsley. 3. break the eggs into a bowl and add the milk. 4. Take the pan and put in the oil. Heat the oil until it is hot. 5. Fry until the omelete in brown on one side and then turn it over in the pan. Which of the followings is the good arrangement to be a good text? Why is it so important for students to continue on to post-secondary education; university or college? The reason is that post-secondary education will allow them to get the skills and tools that they will need to help them prepare for a good career. It has been said that the more education they have the more careers will be open for them to choose from. Employers today will tend to be more open to a person with the more education. However some of them choose to get job right after high school. They believe that education is critical but college is not. In fact, there are numerous careers, such as in healthcare, technology, operations, transportation, and the building trades that do not require a four-year degree from college or university. Furthermore, as they advance in these careers, there is also nothing stopping them from pursing a college degree at a later age. So, what are you doing after graduating high school? Think carefully! preparing for a good career. The title is yummy baby and the Author's nick name Yummy Mummy. It is clear enough to be said that this blog is composed by a mother to her baby. After reading her post I find that the mother and father got the second marriage anniversary. Now they have a very chubby baby. I should say congratulations on their completely fixed nice family. This blog is written in the third person point of view. The third person is the baby itself. It shows that the mother has big effort to take care and do everything for her baby. It is a very motherly tasted blog. I like the way she writes on her blog. She writes about her daily care on her baby. He makes record on her baby development. All these materials of taking care about her baby are the main resource in writing contents for her blog. It is a very useful blog especially for any mother and babysitter. Of course, any father will get advantage to read this blog. Whom is the blog written for? a present of marriage anniversary. daily care of the writer's baby. Why bread is served as breakfast. How to select the correct wheat. The process of baking a good loaf of bread. Woman : I think you can't solve the problem. Narrator: What is the appropriate response? Maybe, but why don't you tell me first. In today's press conference ahead of Saturday's clash against Lazio, Mourinho responded to the comments made in recent days by AC Milan, who claimed that the gap at the top would be smaller if it hadn't been for Adriano's goal in the derby, and their midfielder Massimo Ambrosini, who said that Mourinho will live to regret saying that the Rossoneri will end the season with "zero titles". I have no regrets. I'm man enough to apologise to Milan if, at the end of the season, I'm wrong, said the Inter coach about his a zero titles taunt. I remember Ambrosini insulting ten million Inter fans when he celebrated the Champions League victory. Many years have passed and I have never seen him apologise. He's a charismatic player who has captained a great club like Milan, but I have never heard him apologise to the Inter fans, many of whom live in his same city. Which of the following is not the statement of Jose Mourinho? I have never heard Ambrosini apologize to the Inter fans. I'm man enough to apologize to Milan if, at the end of the season, I'm wrong. the gap at the top would be smaller if it hadn't been for Adriano's goal in the derby. We just have to wait a while longer, but there's not long to go. A unique entertainment awaits you! A special show 3.30 p.m. for an hour. Crocodiles cleaned up, pacified and persuaded to dance to music. A python grappling with a man, coiling round, trying to crush him, but defeated and help us high! Come all, come and see it now. You can gather at the poolside. You can visit Ghost later. In today's press conference ahead of Saturday's clash against Lazio, Mourinho responded to the comments made in recent days by AC Milan, who claimed that the gap at the top would be smaller if it hadn't been for Adriano's goal in the derby, and their midfielder Massimo Ambrosini, who said that Mourinho will live to regret saying that the Rossoneri will end the season with a zero titles'. I think it's right to talk about a goal that some people think is dubious, but we should also talk about how many points have been won with irregular penalties,a pointed out Mourinho. But I prefer not to talk about it because if I do, I will have to talk about many many other things, and it's not worth it. In a championship with human errors, the best always wins. We just have to wait a while longer, but there's not long to go. a. I don't like none of it. d. It can produce bread with better texture and taste. a. Choices after high school. e. An attractive motherly blog. a. How to make bread. d. The gap at the top would be smaller if it hadn't been for Adriano's goal in the derby. Demikian Latihan Soal Try Out Online UN (UNBK) Bahasa Inggris SMA Tahun Pelajaran 2019/2020 disertai Kunci Jawaban dan Pembahasan. Semoga bermanfaat! 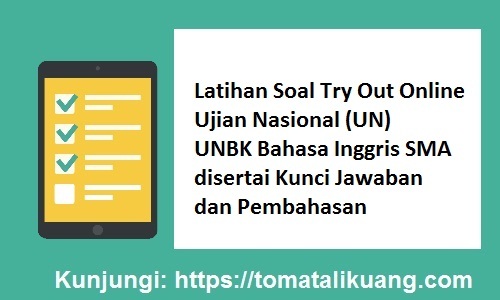 0 Response to "Latihan Soal Try Out Online UN (UNBK) Bahasa Inggris SMA Tahun Pelajaran 2019/2020 disertai Kunci Jawaban dan Pembahasan"